As you might have guessed by now I am a voracious reader and I literally gobble up books be it fiction, nonfiction, self help or business. I fell in love with Devdutt Pattanaik’s writing when I read his 99 thoughts on Ganesha. His grip on mythology with added knowledge the lucid style of writing had me hooked and I can claim proudly I am huge fan of his after that. I had mentally vowed that day to read each and every book written by him. Devdutt Pattanaik has written over twenty five books and 400 articles on Indian mythology for everyone from adults to children. 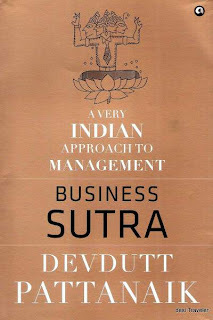 Since 2007 he has been explaining the relationship between mythology and management through his column in the Economic Times; the talk he gave at the TED India conference in 2009; and the show Business Sutra which ran successfully on CNBC-TV18 in 2012, besides numerous other lectures at Indian Universities and management institutes. Very rarely you come across a book on business which is so beautifully written that are still in awe long after you have finished reading it and you recommend it to each and every person you meet. 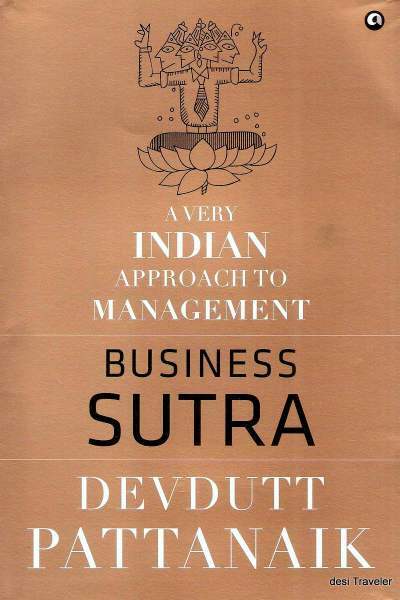 Business Sutra by Devdutt Pattanaik is a masterpiece on business as it brings together the two most powerful things of our country – mythology and business. Our desire to achieve does not happen in isolation. We seek an audience. When the audience refuses to cheer for us, we work hard until they admire us. We want to be seen as we imagine ourselves. Questions teach us, not answers. Crisis increases the chances of learning. To teach, we have to learn to let go. The most two striking features of this book are the YAMA balance sheet and the How to reject this book portion written by the author. The YAMA balance sheet is true eye opener for each one of us as it shows us few facts of life which we had been ignoring till now. And in the portion How to reject this book the author has indirectly told us what to not expect from this book and directly clarified what should we expect. Overall an excellently written masterpiece worth reading by every businessman – one who is successful and one who aspires to be one, leaders (both in organizations and in politics), budding entrepreneurs, students, teachers and all who dream of making it big in the business world. A sure shot must have for all book lovers as this one is a priceless possession to have. Hats Off to Devdutt Pattanaik for this one. Till now I used to just love the way he writes but now I admire his thoughts and writings much more than I did before . 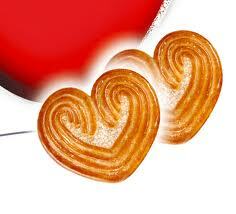 This book is like Little Hearts biscuit - Cute, tasty, sweet, crunchy and filling! Hey Sylvia, thanks so much for stopping by here! Appreciate your follow and comment too. Hey there, thanks so much for this info. Will surely try to participate..! quite interesting I must say. I cannot agree more with the fact that you are voracious reader! Same pinch! I have applied for the review before I stumbled on this review. Good work. Oh Sridevi this book is definately a must read dear..sacchi believe me. Worth every penny spent on it and worth having in collection. I hope you get to read it too.... will wait for your review.